Got it Up and Out! THE ENGINE IS OUT! Yes, it is OUT. The car and engine are now separated. This is in a large part due to Len Spinelli who again sacrificed a day to help me out. Len was just appointed President of the NJRA’s (our local club). It couldn’t have happened to a nicer guy. Let’s talk about the process…. not the presidential appointment process but the engine removal process. As you know from the last post, I thought I lined everything up excepting the removing of the engine mount bolts (front and back) and the connection between the flywheel and the engine. I didn’t do some other things (who would have known to do them) and our planned 2 hour project took about 4 hours. Just to put this in perspective, a pro can do the whole thing including prep in a couple of hours. DO NOT USE THIS POST AS THE “HOW TO GUIDE”…. as I try to note regularly, I don’t have a great clue about how to do these things and am learning as I go. Let’s talk about where things went awry. The rear engine mounts are in a location/shape that didn’t allow the ratchet set to be utilized to remove the bolts. The safety wires there were awkward to reach. We were turning some of these about ¼ turn and then needing to re-position the wrench. The jack that I used to raise the transmission did not have enough height to raise it enough once we started to remove the engine. We were afraid to lower the transmission once we got the engine removal started. We spent 2+ hours futzing with jacks, stands, and wood blocks and finally got it resolved. I blame lack of coffee. Note to others: make certain your jack can give you the lift you need OR start with the jack on a block or two so you have the needed lift. One of the two bolts by the wishbone universal joint on the bottom of the housing wasn’t allowing the right ratchet OR wrench to go onto it. We needed to use a thinner wrench so it didn’t have to clear the not-so perfect head. That engine didn’t want to leave the car. It was “stuck”. We had to continually rock/shake the engine from the transmission. Oh, we went to video things….. the camera ran out of memory. We did get a few things documented… but most of this was after the fact. What was the most interesting part of the process? Finding loose pieces in the bottom of the flywheel housing. This doesn’t mean I am done. The rebuilder has suggested that I remove the bellhousing (where the pedals are connected) to bring that up for a rebuild AND it has been strongly recommended by many that I take this time to take apart and rebuild the transmission (even though it isn’t giving me trouble). I’m in the process of figuring out what will work and what won’t. I don’t want the engine rebuild to become a bolt-by-bolt-entire-car-rebuild. It’s official. I can no longer claim to not be a “car guy”. I own an engine hoist! You can’t be “not a car guy” and own an engine hoist. 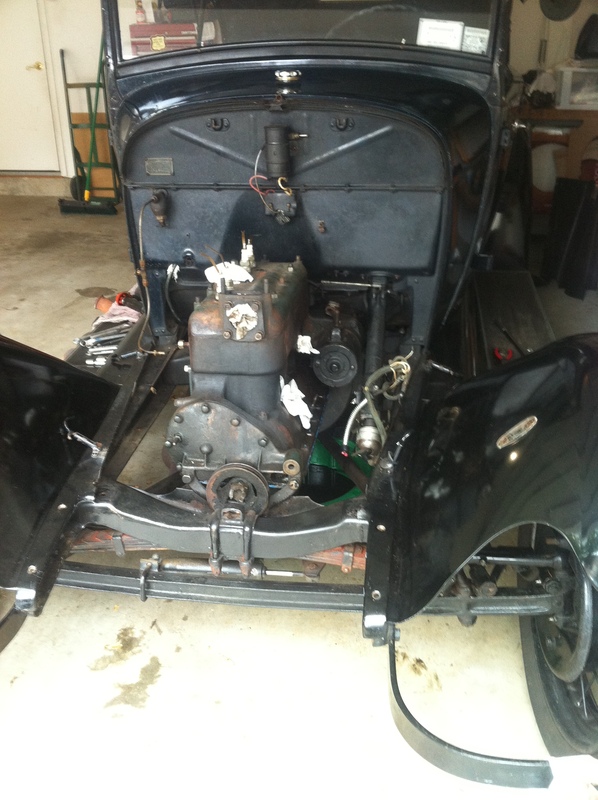 For a few years I have known that the engine in my Phaeton was past due for a rebuild. I’ve been putting it off. My last attempt at an “old car road trip” let me know that it was time. I bought a Hoist. Let’s talk hoists. 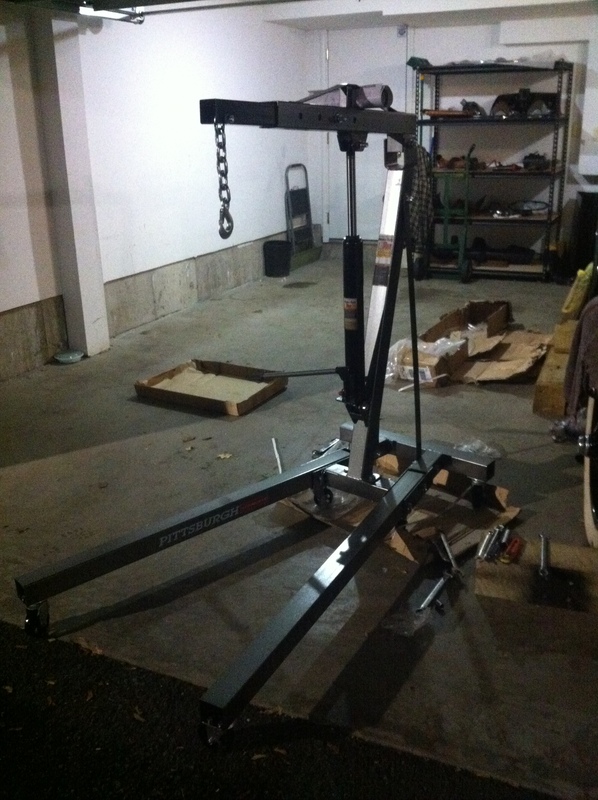 I purchased a Harbor Freight 1 ton foldable hoist (assembly required) from Harbor Freight via phone after doing some quick research and speaking with a few folks who have used this exact hoist to remove engines from their Model As. I was told this hoist could do the job and had the clearance needed. With shipping and tax (after asking if there were any coupons or deals for the hoist and being told “yes”) it cost $115 delivered to my door. It took about an hour or two to assemble. I still need to tighten things up before use. Why did I buy the hoist instead of just renting one for the days I need it? It was cheaper to buy then to rent and if I rented it I would have no way to transport it between the rental place and my garage. I figured that even if the rent vs. own analysis resulted in a break even or a slight loss, I now have a hoist I can lend out to club members if they ever need it. I also don’t have to worry about returning it in a timely manner or doing work at anyone’s pace but my own. << it is now Dec 31st when I am posting this and I still have the engine on a stand attached to the hoist, so I guess buying proved to be a great call. >>. There are other things I need to remove the engine safely. First I need some chain and the eyelets. These I am borrowing from a club member that lives about 10 miles away. I’ll return them in a timely manner. Then I need a place to put the engine once it is out of the car. Some people just put it on the garage floor or on some old cardboard. 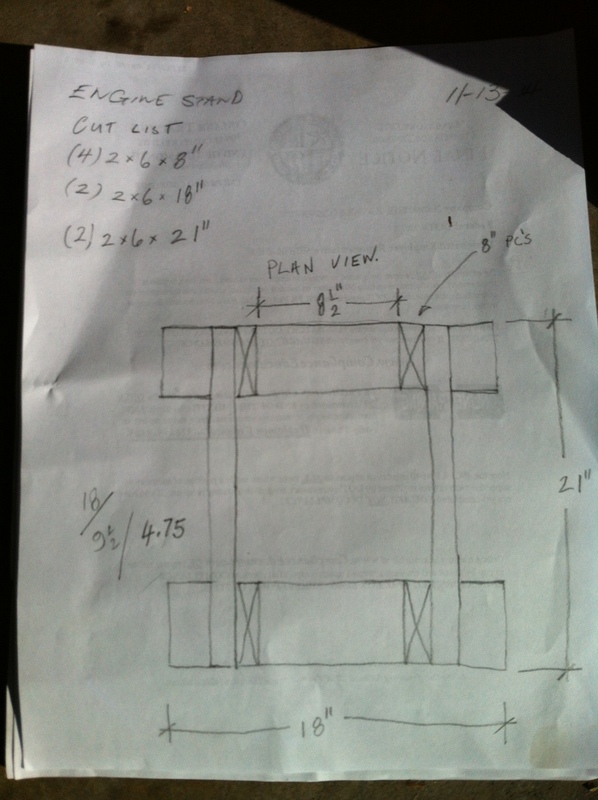 I found plans for a wood stand via Fordbarn.com and have the good fortune of having a friend who owns a carpentry shop down the block. It cost me a few cups of coffee as payment, but I probably have the best built wooden engine stand in the country and it too will be made available to the local model A club. Here are some photos as well as a cut-list for the stand. OK, I need to scan this, but I can’t find the original…. when I find it I will scan it. I’ve also decided to prep the car for the engine removal. If you have followed my blog you know that I am regularly removing all sorts of things from the car. This experience was tremendously helpful. It took me a couple of hours and BAM!!!! I should note that I did have to purchase shelving (ordered from Walmart online and delivered for $75 with assembly required) so I could put the parts somewhere. It was challenging to keep myself from taking things apart PRIOR to having a place to put them. So that I don’t completely mess things up on reassembly, I did bag up parts and have tried to label everything. I’m also now faced with a few challenges. The cost to rebuild an engine is considerable. You’ll hear “estimates” of $3,000 to $7,000 from various vendors but no one knows for certain until they take everything apart and can see what needs to be done and what needs to be stitched/replaced/redone/etc. The quotes also aren’t always consistent in what is included. My engine has some typical cracks and such and I suspect will fall in the middle of this range. To some degree you just have to trust that your rebuilder is honest. People have been asking me who I will use for the rebuild. I wish I could use several vendors. Here is a list of questions (provided by a rebuilder) that one might want to ask a rebuilder before deciding on who to select. I see this as a way of figuring out if the rebuilder is qualified. Do you do the work in house and if not who does? how do you clean the engine and parts? do you magnaflux block and parts,pressure test? what babbitt do you use? what machine work gets done on the block and why? do you replace the valve seats and how many? what parts of the block do you remachine? do you balance the engine? what parts are provided in your engine rebuild? do you resurface the flywheel? there is a exact mesurement of steps. do you regrind the cam and what grinds do you offer? do you rebuild the oil pump? do you replace all the hardware in the engine studs,bolts ,nuts? do you repaint the engine is it factory color? do you install adjustable lifters? what makes you different than the others? do you have references you could provide? how long does it take you to finish the engine? If the block,flywheel housing ,head is cracked how do you repair? How did I decide on whom to use and who am I using? Al Clarke at Go Devil Garage is highly referenced and was very helpful when I was in Albany. He knows what he is doing and Is highly qualified. John Gulbankian from J&M Machine in central Mass is also highly referenced. I have been speaking with him regularly for over 2.5 years whenever I had engine questions. He too knows what he is doing and is highly qualified. I’ve been to both of their shops and know people who have used each of them with VERY GOOD RESULTS. Both have my respect, gratitude, and thanks for all their help. If I had two engines, each would get one to work on. I have one engine. While I am bringing the engine to John (as was my plan prior to having met Al), I want it on the record that Al Clarke seemed like a true stand-up guy and someone I would trust with the rebuild. Al, if you spin through this way (or on my next road trip), I’d love to buy you a beer. My next post should include the engine being hoisted. Stay tuned.